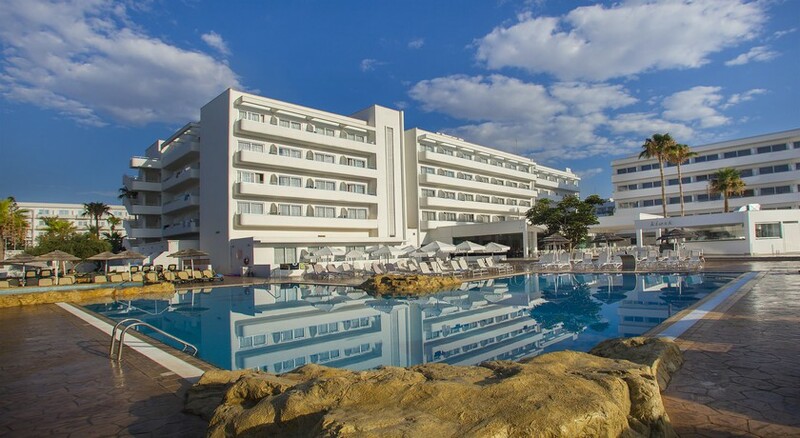 At a distance of 100 metres from the serene sandy beach and the fishing port of Ayia Napa lies the beautiful Atlantica Sancta Napa Hotel. Modern amenities, floodlit tennis courts, mini-golf courses, open-air swimming pools and gyms together make Atlantica Sancta Napa the ideal holiday hotel. With a minimum occupancy of 3 persons per room, the hotel is extremely popular among family holiday seekers. The white-toned guestrooms overlooking the garden or sea are modern and charmingly decorated with all necessary amenities. 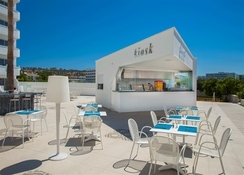 The on-site restaurant serves breakfast, lunch and dinner buffets, while there are two bars where you can sip on some of the best fusion drinks, while basking under the summer sun. The convenient location in the centre of Ayia Napa makes the hotel close to local attractions such as shops, bars, cafes and restaurants. 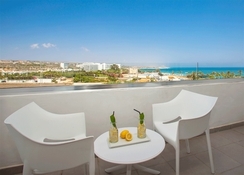 Atlantica Sancta Napa Hotel is located at a distance of 200m from the resort centre of Ayia Napa. It is 8 kilometres from the coastline, which is dotted with 14 Blue Flag beaches. 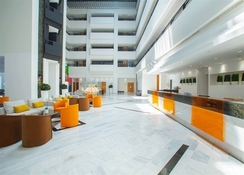 Guests can enjoy a complete holiday experience while staying at this centrally located hotel. The hotel is also easily accessible from all corners of the island. For instance, it is just an hour’s drive from the nearest airport. The hotel accommodates all its guests within its arty ambience of comfort and luxury. Its rooms are divided into the following types: Twin/Double Room, Twin Room Side Sea View, Twin Room Sea View, Superior Land Review, Superior Room Pool View, Family Room, and Bungalow –These room types are well equipped with modern luxuries and amenities including air conditioning cable TV sets, direct dial phones, hair dryers, ironing boards, refrigerators and so on. Margarita Main Restaurant, at Atlantica Sancta Napa Hotel, serves an extensive variety of buffet styled breakfast, lunch and dinner. The restaurant also hosts live cooking shows for budding cooks. Atrium Cocktail Bar serves late night drinks from a diverse range of alcoholic, non-alcoholic beverages. 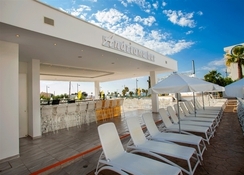 The pool bar, Andriana, helps you keep your glasses full throughout the day while you sunbathe. Aqua-aerobics, pool games, a wide range of water sports and live performances – Atlantica Sancta Napa Hotel has it all when it comes to sports, games and entertainment. The in-house team of animators perform to jaw-dropping audiences almost every night, while kids have an exclusive playground to keep themselves active. You can also visit the waterpark, where water slides and splash areas guarantee a fun-filled afternoon. Men are required to wear full-length trousers for all evening meals.